Nigella begins her recipe for The Ultimate Greek Salad in Forever Summer by explaining her red onion trick. 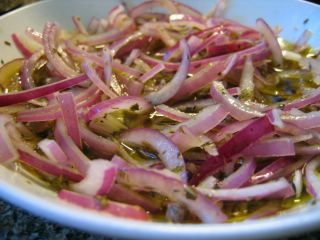 Basically, red onions, if sliced and then steeped (or fried) in oil, and flavoured with lemon juice, can instantly add interest and lift to pasta, meat or a salad. For this particular salad, Nigella says to slice a red onion finely, add 1 tablespoon oregano, 1 tablespoon red wine vinegar and 200 ml extra virgin olive oil, and leave it to steep for 2 hours or longer, before tossing it through the remaining salad ingredients (lettuce, tomatoes, olives, feta - the usual suspects). This not only mellows the acrid onion flavour, but turns the onion slices a beautiful bright pink colour. 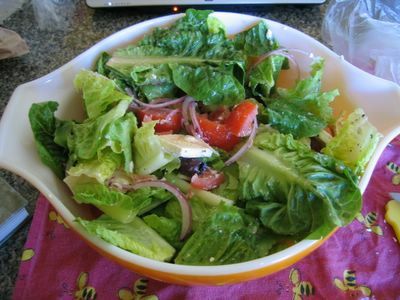 I prepared the onions on Monday afternoon, with the intention of finishing off the salad the next day. 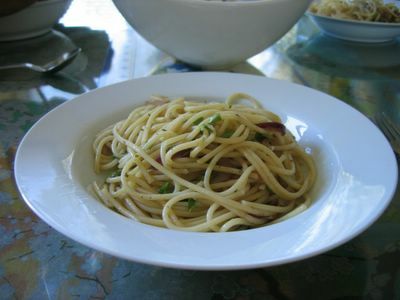 However, I became ravenously hungry upon reading Nigella's idea of adding fried red onion to cooked spaghetti with raw tuna and parsley, so I used half the onions for a pasta dinner that night. I fried some of the steeped onions in a pan, added capers and anchovies (raw tuna would have required a trip to the shops - too much effort! 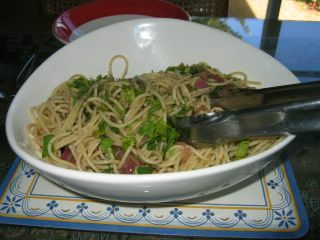 ), and tossed it through hot spaghetti with parsley. Amazing! The next day I used the rest of the onions in the salad. I've made this one innumerable times before, and it was as delicious as ever. It is highly compulsive - just try limiting yourself to one serve! Greek salad - it must be a brilliant recipe if it can make me wolf down lettuce compulsively! Just thought I would check in and say that I LOVE your site! Mark put me onto it and now I check in every day. As soon as I get home, im slicing up that red onion I have and throwing it in a bowl with the oily oregano vinegar business, just because the internet told me to. Weeee! Glad you posted this recipe as I have flicked past it hundreds of times wihtout giving it a second glance thinking it must just be an ordinary Greek Salad, now that I know what it is I will be trying it our very soon, love Greek salad & this enhanced version sounds mouth watering! That pasta looks heavenly, Sarah! Sarah - that past looks so tempting! !